Thirty-seven years after the Army abandoned Fort Davis, a celluloid cowboy announced plans to convert the old cavalry post into a motion picture colony and resort. Unfortunately, he soon found out that timing is as important in real estate development as it is in lassoing a runaway steer. Born in Indian Territory in 1885, John Hartford Hoxie started out as a cowboy, took up rodeoing and in 1913 landed a role in a silent western called “The Tragedy of Big Eagle Mine.” Soon billing himself as Jack Hoxie, throughout the rest of the decade and well into the 1920s the stocky, cleft-chinned cowboy starred in scores of flickering horse operas. 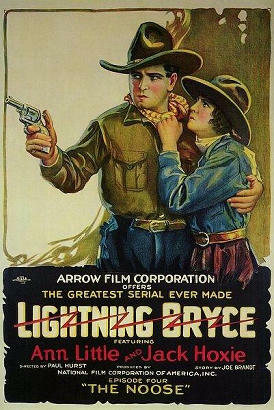 His biggest hit came when he played Buffalo Bill in “The Last Frontier,” a pre-sound blockbuster released in 1926. But as Hollywood moved on to “talkies,” producers discovered that while Hoxie had a good voice, he couldn’t remember his lines. Thus tarnished, his star status had begun to fade by 1929. That’s the year he decided the Big Bend would make a good location for another shot at the big time. In April 1929, Hoxie rented the old fort and announced plans to transform it into the Hoxie Stockade and Motion Picture Studio. The officer’s quarters would be restored to accommodate the tourists who would come to enjoy a large swimming pool, a polo field, golf course, tennis courts, dance pavillion, rodeo arena and more. A month later, Hoxie hit Fort Davis and invited local folks to join him in the venture, signing up investors at $100 a share. 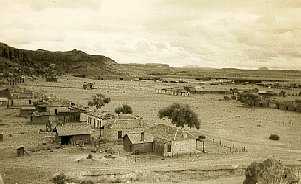 Though only two of the twelve officer’s quarters had been rennovated by the following spring, Hoxie did bring 3,500 or so visitors to Fort Davis on March 23, 1930 for a rodeo touted as featuring six Hollywood “Cowboys and Cowgirls.” But a severe dust storm ended the show before it had hardly begun. That proved only the beginning of a run of bad luck for Hoxie and his dream. With the economy continuing to worsen following the October 1929 crash, Hoxie’s financial backing dried up faster than a cow pattie in July. Not long after the fizzled rodeo, Hoxie stored what tack and furnishings he had acquired, hired a caretaker for the fort, and left town to perform with the 101 Wild West Show. Publicity wise, 1931 got off to a bad start when three of the actor’s associates in the Fort Davis venture enlivened a boozy party in Midland thrown by oilman Oscar Yates and his wife. Late in the evening, having enjoyed way too much non-petroleum lubrication, Western actor and former Texas Ranger Buck Jones pulled a loaded .38 as movie producer Bert Bennet and Lee Cox, a former Sul Ross College student who had gone to work for Hoxie, looked on. Yates told Jones to stow the hardware, to which he replied: “I have had 25 years’ experience with these things.” And then the pistol discharged, dropping a guest from Abilene to the floor with a bullet in his intestines. At first, the partygoers thought Jones had pulled a Hollywood stunt, but then someone opened the downed man’s coat and saw real blood. The only favorable ink Hoxie got that year came in February, when the San Antonio Express carried a story about “Dynamite,” a black bear Hoxie kept at Fort Davis. When the year-old female awakened from her winter hibernation Hoxie and animal trainer Bert DeMarc brought her a tub of water and a quart of cornmeal mush. “She licked the platter clean, boxed it 40 feet aside with her paw, hopped upon the top of her den and gave herself a good scratching,” the newspaper reported on what must have been a slow news day. Hoxie’s bear may have ended her seasonal snooze, but the film star’s plans for a Big Bend resort continued in hibernation. With the Great Depression deepening, Hoxie soon rode out of town on the figurative horse he had come in on. In the fall of 1932, his wife Dixie Starr slipped into town just long enough to collect all the costume trunks and boxes of tack left behind and return them to California. Dozens of Jeff Davis County investors never got their money back. Hoxie continued rodeoing for another 20 years, but his career had peaked decades before. The old actor did a slow ride toward the sunset, dying in 1965 at 80 in Elkhart, KS.